In the beginning, Dr. D. Y. Patil Vidyapeeth, Pune (DPU) started off with only one institute. Over the last 14 years it has grown manifold! During that duration, 9 more professional institutions were started and came under the umbrella of the parent Institute. Today, the 9 institutions of Dr. D. Y. Patil Vidyapeeth, Pune have created a brand name "DPU" in the field of medicine, dentistry, nursing, physiotherapy, optometry, biotechnology, management, Ayurved, Homeopathy and Distance Learning. These institutions are providing quality education to about 4500 students. What distinguishes the Vidyapeeth among others are its state-of-the-art infrastructure and dedicated faculty. All the programs offered in these Institutes are duly recognized by respective Councils such as MCI/DCI/INC/CCIM/CCH/AICTE/UGC, etc. Dr. D. Y. Patil Vidyapeeth, Pune has been categorized as “Category-I Deemed to be University” by University Grants Commission (UGC) as per the provision of Categorization of the Deemed to be University under UGC [Categorization of Universities (only) for Grant of Graded Autonomy] Regulations, 2018 vide its Letter dated 20th April, 2018. Dr. D. Y. Patil Vidyapeeth is mainly dedicated to health care related courses such as Medicine, Dentistry, Physiotherapy, Nursing, Optometry, and allied integrated healthcare teaching, learning and research between modern medicines with alternative medicine, development of education and Research in Yoga and Naturopathy, Innovation in Teaching & Learning and Research, Bioethics, Oral Implantology, Oral Oncology, Dental Material Testing, Biomarkers, Advance Centre for Molecular Diagnostics for human Diseases, etc. All the different Institutes have libraries! In total, there are about 62000 books along with journals, e-books and e-journals in these libraries. 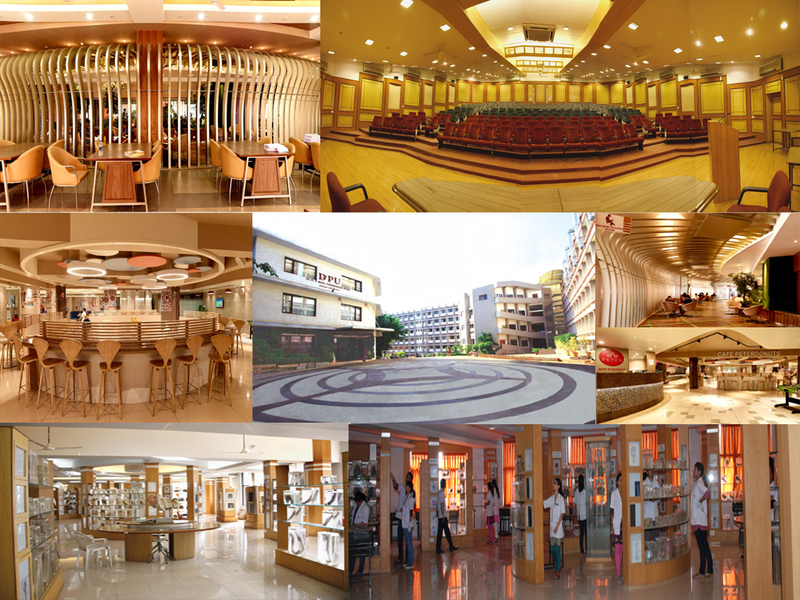 The library of the Medical College is one –of –its kind with spacious reading rooms for students and faculty. The Central Research Facility is equipped with the latest equipments like Flow Cytometer, Confocal Microscope with software for Karyotying & FISM and Trinocular microscope. The Vidyapeeth has also established a Regenerative Medicine Lab in the Dental College and a Molecular Diagnostic Lab in the Medical College. The Regenerative Medicine Lab was established to form a nodal reference centre for dental research all over India. It offers a platform for in vitro screening of drugs, pharmaceuticals and dental materials. It has given a platform to medical and dental surgeons to refine their skills and think of upcoming novel therapeutic applications of stem cells for unfulfilled medical needs. The banking of oral epithelial cells from oral cancer patients has permitted bio- banking of the precious material. On the other hand, the Molecular Diagnostic Lab provides a platform for ongoing and proposed research theme areas. It also assists in creating awareness and sensitize the population about the importance of detection and diagnosis of rare genetic diseases. To extend and support teaching-learning activities of UG / PG / MD / MS programs and start certificate / Diploma courses in molecular diagnostics. The Government of India, Ministry of Human Resource Development, on the advice of UGC, declared Dr. D. Y. Patil Vidyapeeth, Pune as ‘deemed-to-be university’ constituting of Dr. D. Y. Patil Medical College, Hospital and Research Centre, Pimpri, Pune vide its notification dated 11th January, 2003. Later on, the Government of India, Ministry of Human Resource Development included three more institutions under the ambit vide its notification dated 20th September, 2006.The Institutes were the Dr. D. Y. Patil Dental College & Hospital, Pimpri, Pune, Dr. D. Y. Patil College of Nursing, Pimpri, Pune and Dr. D. Y. Patil College of Physiotherapy, Pimpri Pune. These 3 Institutes were established in 2000. Subsequently, UGC vide its Office Memorandum dated 16th March, 2010, also gave approval to the three new institutes, Dr. D. Y. Patil Biotechnology & Bioinformatics Institute, Pune, Global Business School & Research Centre, Pune and Dr. D. Y. Patil Institute of Optometry & Visual Sciences, Pune. On 4th August 2010, the Institute of Distance Learning, Pimpri, and Pune was given approval by the Joint Committee of UGC-AICTE-DEC, New Delhi. Subsequently, UGC gave its confirmation for continuation on 3rd June, 2014. The latest approval was granted by UGC on 6th September, 2016 for 2016-17 and 2017-18 academic year. The Vidyapeeth has also applied online for recognition of theAcademic Session July, 2018. Recently, the Ministry of Human Resource Department (MHRD); vide its notification No. F.10-12/2016-U.3(A) dated 23rd February, 2018, on the advice of UGC, included the Dr. D. Y. Patil Homeopathic Medical College & Research Centre, Pimpri, Pune and Dr. D. Y. Patil College of Ayurved & Research Centre, Pimpri, Pune under the umbrella of Dr. D. Y. Patil Vidyapeeth, Pune (Deemed to be University) as constituent colleges. On 3rd March, 2015, Dr. D. Y. Patil Vidyapeeth, Pune has been re-accredited by NAAC with a CGPA of 3.62 on a four point scale at ‘A’ grade. This is valid up to 2nd March 2020. The Vidyapeeth is also an ISO 9001: 2015 Certified University. In 2013, DPU Ethics Committee is registered by Drug Controller General of India with FRCA (Reg. No. 083930601). It was again re-registered in 2017. In the same year, DPU has registered the Anti Ragging committee! It also has registered Vidyapeeth Student Council, Grievance Redressal Cell, Research Advisory Board, Internal Complaint Committee, International Quality Assurance Cell and Parent-Teacher associations are fully functional. In 2014, DPU was recognized as the ‘Scientific and Industrial Research Organization’ (SIRO) by Dept. of Scientific and Industrial Research (DSIR) for a period of 3 years. (30/04/2014 to 31/03/2017). The said recognition was renewed for a further period of 3 years (01/04/2017 to 31/03/2020). Under National Institutional Ranking Framework (NIRF) 2017, conducted by Ministry of Human Resource Development (MHRD), New Delhi, Dr. D. Y. Patil Vidyapeeth, Pune has achieved 47th rank in the University category and 76th in the Overall Category in India. Further, in NIRF-2018 ranking, the Vidyapeeth has achieved the 18th rank in Medical Category, 52nd rank in University Category and 79th rank in the Overall Category in India. The Vidyapeeth has entered into collaborations with large number of national and international institutions / industries for its academic growth, development and contribution towards national development in health care and professional education. It has enhanced the quality of teaching-learning process, research activities, up gradation of facilities and services, contributed for the enhancement of quality of services and publications in leading national and international journals and have helped in receiving financial assistance for collaborative research projects. The MoUs have garnered opportunities for clinical trials from organizations like WHO. It has also provided assistance in Industry and Institute sponsored projects, training and hands-on experience for students, faculty and student exchange; webinars and sharing of resources. The Biotechnology Institute has research-based collaborations with the University of Skövde, Sweden in the area of environment and health protection. The collaborative research projects were funded by Swedish International Development Cooperation Agency (SIDA) which gave scope for meaningful interactions between the counterparts that led to technology development. This collaboration has resulted in generation of five national patents. Not only that,Dr. D. Y. Patil Vidyapeeth, Pune (DPU) and Praj Industries had entered into collaboration for a research project to develop microbes and microbial processes for production of compounds of industrial significance. Importance of this research project can be gauged by the fact that Department of Biotechnology (DBT), a wing of Ministry of Science & Technology, Government of India had sanctioned a grant of Rs 7.13 crore for the same. Linnaeus-Palme Teachers’ Exchange Program between DPU and University of Skövde, was funded by the Swedish Council of Higher Education, under which two faculty members from DPU (Biotechnology Institute) visited University of Skövde, Sweden for a duration of one month and two teachers, Dr. Abul Mandal and Dr. Helena Enroth from University of Skövde visited the Biotechnology Institute during 2017-18. Also, under a bilateral agreement signed between DPU and University of Skövde, Sweden, four students of M.Tech Biotechnology have completed their one year project at Sweden during 2016-17 and four more students of M. Tech Biotechnology of the present batch are performing their project dissertation at Karolinska Institute and Lund University, Sweden for 2017-18. The Vidyapeeth has developed a system to recharge and rejuvenate the faculty. The strategies are implemented at three levels – (i) at Vidyapeeth level centrally through University Centre for Professional Education & Faculty Development (UCPEFD), (ii) at Institute level, continuous education units MEU, DEU, NEU, PEU, PTEU, MgEU and OpEU, and (iii) at departmental level for Medical and Dental Colleges. Recently, Biotechnology Institute of the Vidyapeeth has received the prestigious ‘DST-FIST’ award for the development of infrastructure and equipment for teaching and research.